All references to shooting on a Scottish estate will be in the realms of photography for the purposes of this blog, I know how to point a lens not a barrel. We armed ourselves with our SLRs, lenses and a GoPro strapped to the bonnet of the 4×4 and met two professionals who combine fun and knowledge into the most inspiring days. 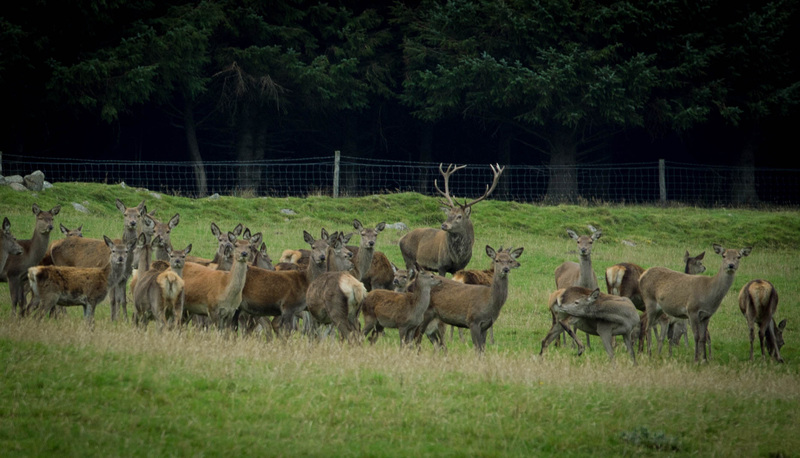 The Game Keeper, Colin, has over 30 years experience in land management, wildlife and several estates across the Highlands. Colin can take you to places that many others will never see, places so beautiful that I spent a lot of time with my mouth open saying ‘wow’ (I’m sure that there could be a more professional and profound way of expressing myself!). The Photographer, Mary, is a professional photographer with a wealth of knowledge and is filled with passion & enthusiasm for life. The two of them combined ensures a fun packed exclusive day in the Highlands. 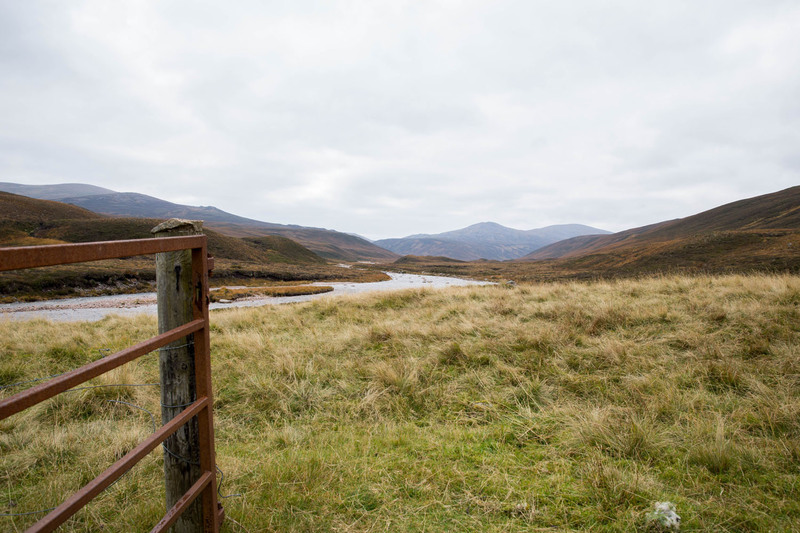 With Colin comes the access to shooting on the Scottish estate, his professional contacts open up several beautiful environments in the Scottish Highlands. He knows the estates like the back of his hand having worked for many years with the land and the wildlife, with the Range Rover this haven of Scottish heritage is accessible. Every corner we turned and the higher we climbed the views of mountains became more breathtaking, mountain after mountain repeated in the distance. Walk on the moorland to inhale the musky smells of the rutting deer, the roar of the stags and cackle of the grouse, then climb down to the river bed as the river crashes through the rocks and watch the salmon leaping. At lunchtime we arrived at a bothy tucked away high up in the mountains, furnished with the basics to ensure cover during adverse weather, but enough to enjoy our picnic lunch and a wee dram. 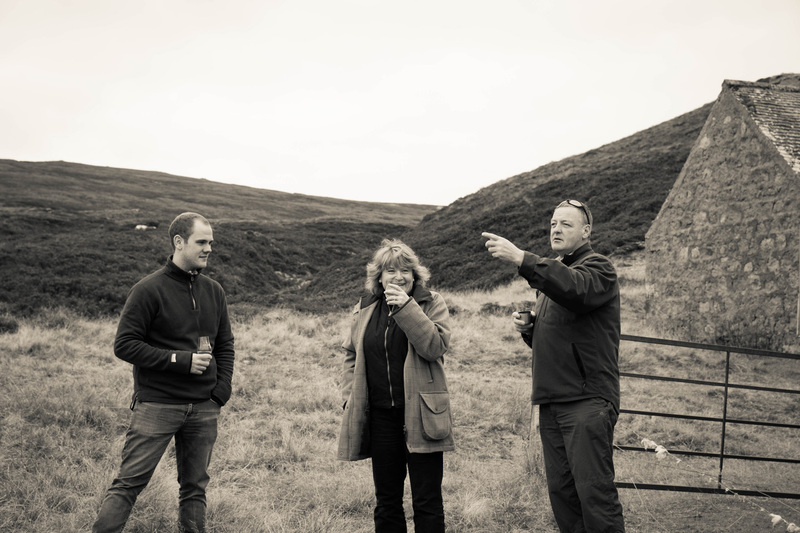 Colin scooped the purest water from the river flowing past the bothy to add to the dram of malt whisky ensuring that the whisky experience was fabulous. We chatted about the history of the bothy, the people that would have taken shelter there in harsh weather, the fishing parties that may have slept there and the shooting parties that may have dined there. You could imagine that with the fire lit it would be so cosy looking out on the driving rains or falling snow. After lunch we returned across the mountains, through rivers and along tracks lined with 100-year old heather. The grouse flew out from the heather across in front of us, the stags on the sides of the mountains turned their antlered-heads to look and a golden eagle soared above us. If there is a bucket list of must sees for the Highlands, I think we ticked off most of them in one day. Oh and to mention the shooting part of the day, we attached the GoPro to the bonnet and videoed the 4×4 action and we got the cameras out to capture roaring stags, waterfalls and landscapes. An epic day for a outdoor loving / camera loving / fun seeking / knowledge thirsty individual; thank you Colin and Mary. This is all on the doorstop of Muckrach Country House Hotel. You too could enjoy the changing seasons; the mountains turn from purple in August to orange in Autumn, the osprey leave for warmer climates, the red squirrels have gathered all the fruits of the trees and large flocks of chaffinches have arrived to feed. All of this natural phenomena can be experienced alongside relaxing in the warmth of a boutique hotel in the Cairngorm National Park. From Spring 2015 stay with us, eat with us or just come and see us, you will receive a warm Highland welcome.